Defence singlets available in size 0000-size 6 in Army, Airforce or Navy. 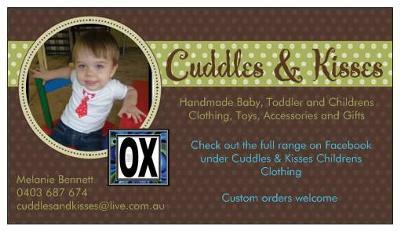 Handmade clothing for babies, toddlers and children made here in the Territory by Melanie Bennet, a local Darwin mum. 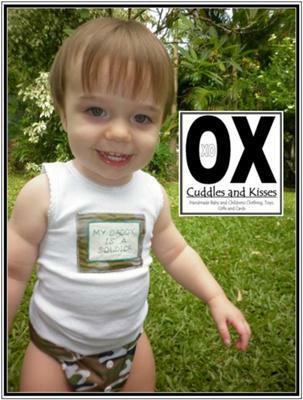 "It all started by making gifts for people as baby presents and my son Saxon when he was born. People would see the outfits and ask where I got them from. I would say I make them then friends and people in the street would put in their orders. So it all started from there. I now sell at the local craft fairs around town, charity function markets and also online. Customised and Personalised items are made to order." Postage available and free delivery for local Darwin/Palmerston residents. Feel free to contact me, Melanie Bennett, for more information. Join in and write your own page! It's easy to do. How? Simply click here to return to Darwin crafts.